The United Nations Security Council is the most important organ in the United Nations, charged with determining “the existence of any threat to peace, breach of peace, or act of aggression” and to “maintain or restore international security” with military force if necessary. 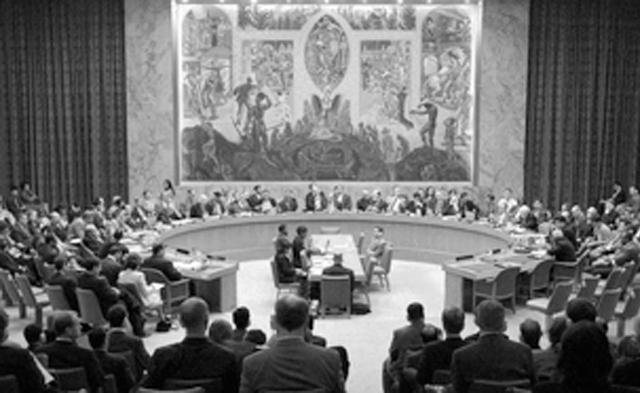 1 The first attempts at reforming the Security Council was made on December 17, 1963, where the United Nations General Assembly voted to amend Article 23 of the UN charter, increasing the non-permanent members of the Security Council. 2 More recently, the former-Secretary General Kofi Annan’s “High Level Panel on Threats, Challenges and Changes” urged the nations to expand the membership in the Security Council and to expand the number of permanent members who may or may not be able to wield the veto power. 2 This article will examine the opposing viewpoints on the issue of Security Council reform and discuss the recently proposed plans of reform. It is composed of fifteen member states, of which five are permanent and veto-wielding member states - the United States, Russian Federation, the People’s Republic of China, the United Kingdom, and France – and ten elected member states which rotate on a bi-annual basis. The Council was created on 17 January, 1946, following the devastation of World War II, and its authority is derived from the fact that it is the only body in the United Nations with legal sanction behind its resolutions and the ability to sanction military actions in order to maintain international stability. The Korean War was the first instance in which the council was able to rally the international community in restoring the regional power-balance and stability; the United States-led UN coalition, supported by armed forces of twenty different nation-states, sought to “to repel the armed attack and to restore international peace and security in the area.” 1 The Security Council has been and is at the forefront of every international crisis, and this is further highlighted by the fact that it is the only body in the United Nations where its members have to be present in the headquarters all the time for fast and flexible response and mobilization. Since the primary international body involved in helping to mediate and to end violent conflicts is the Security Council, many plans have been called forth to reform the Security Council into a more representative, flexible, and transparent body in mobilization. Furthermore, reforms are seen as necessary in maintaining the council’s waning political legitimacy amongst the members of the United Nations. 10 The political legitimacy of the Council is particularly relevant because, although the council’s decisions have the force of law, it must rely upon the inherent, trust and faith of its member states to carry out its resolutions. Without any political legitimacy, the council’s resolutions would be ignored and as such the effectiveness of the Council would wane and soon become obsolete. Also linked to this is the specific argument that adding veto powers would ultimately cause the Council to stall and would accomplish less in its tenure. However, in the last two decades the veto power has only been used on nineteen occasions, with the vast majority coming from the United States and the Russian Federation. 8 The power of the veto is rarely used and only used if it greatly conflicts with the policy of the nations involved. Therefore, the decision to give more members the power to veto would rarely conflict with peace keeping operations as current candidates for the new seats such as Brazil (who contributes the second largest amount of peacekeepers and funds in South America) are already active participants in international peacekeeping. 5 Also, the three proposed plans - except for the G4 plan which may consider giving the new permanent members veto power after fifteen years - do not give veto power to the new permanent members, meaning that the power would not be abused by the new members. Despite the credentials of the leading candidates for Security Council reforms, it is important to be aware of the difficulties and problems in expansion. One of the major problems with the concept of increasing the Security Council’s membership is the idea of efficiency. The primary reason why the Security Council is given the power to handle issues of international peace and security, as opposed to the General Assembly, is due to the fact that the Council needs to be able to act quickly and decisively on any crises. A common criticism of the Council is its inability to respond to international crises. For example, in the Darfur Crisis, the Council’s sluggish response was partially caused by the fact that the global community could not even agree on how to respond to the violence. 9 If the council’s membership had been even larger it is fair to argue that the council would be even slower to act, as the Council’s members would spend more time clashing with each other rather than coming up with substantive solutions. The unique harm that comes from this expansion of the Council is that it can do the very thing that proponents of expansion argue, it could de-legitimize the Council. When the Council cannot solve the very problems that it was intended to solve, then the entire institution can be seen as increasingly worthless. 11 This legitimacy problem becomes increasingly more apparent when answering the question on which countries should be permanent members of the Security Council. What should the qualifications be for nations being permanent members of the Security Council? For the most part, the Council members are expected to respect the very ideals of the UN Declaration of Human Rights and basic liberal democratic values. The members of the Security Council also expected to have sizeable militaries and large economies. However when examining issues such as geographic breadth, it is apparent that none of these criteria have any strong correlation with geographic breadth besides western industrialized nations. It can even be argued that nearly the entire continent of Africa does not possess all of these attributes. The only geographic area that really fulfills most of these conditions is the Western industrialized world with a few exceptions. Many nations that are being considered do not appear to be the best examples of nations that embody these concepts. Thus, the Council risks losing its legitimacy when unqualified states are given permanent seats in the Council. When looking at the prominent contenders for permanent Security Council seats, it is evident that many of them are less than ideal candidates. Looking at two case examples, it is not hard to see the inherent difficulties in judging which candidate is more qualified. For example, India seems an ideal candidate as it represents a large population and has a significant economic and military presence in the world. However, its refusal to sign important treaties, such as the Nuclear Non-Proliferation Treaty, raises concerns about India’s qualifications. Germany, a seemingly ideal candidate, fulfills most of the criteria for permanent representation, except for the fact that the Western powers – the United States, France, and United Kingdom - are very overrepresented in the Council. With over half of the Western powers being permanent members, one could easily contest that Germany’s candidacy does not fulfill the spirit of increasing geographic diversity. Thus, the ideas of geographic breadth and qualifying characteristics start to look more and more mutually exclusive of one another. Although there is broad consensus that reform of some kind is need to increase the political legitimacy of the Security Council and make it a more representative and flexible organ, there are many opposing viewpoints on the main proposed reform plans because of their merits and faults. Proponents of reforming the Security Council argue that the current power structure of the Security Council represents more of an oligarchy than a legitimate representation of the international community as a whole. This current power structure, reformers argue, does not necessarily serve the international community as a whole but rather the wishes and whims of its most powerful permanent members. Therefore it is essential to include more members in the Council to ensure that the Council reacts to all major international crises. Although those who disagree with the three major proposed plans do not necessarily discount the idea of the reform as a whole, they point out that the debate of this magnitude must be carefully considered, examined, and regulated. These opponents to reform claim that although increasing the membership of the Council may allow for more crises to be put on the table, the ability to react to these crises swiftly would be severely hampered. They contend that the addition of new members would simply bog the Council in endless debate and prevent them from acting. Also these opponents are skeptical that any reform could be implemented as it is close to impossible to pick out ideal candidates. This is due in no small part to the inherent difficulties in fulfilling the idea of geographic diversity while simultaneously ensuring that any prospective nation has significant standing in the international community. Keeping this in mind, the international community should not lose sight of the positive and beneficial aspects of the Security Council reform because of the debate and objections around the proposed plans of reform. The inherent skepticism in the con’s arguments and the goals that the proposition argues for should both be taken account when deciding what course of action should be taken. The council is not only clearly in need of some sort of change in order to adapt to the realities of the twenty-first century, but also for nations to reach a feasible solution that works. Only after addressing the concerns of opponents to reform, can the Security Council truly claim to be an effective and undisputed legitimate international body. The UN Charter and Security Council Resolutions. United Nations. Pan, Ester. “Humanitarian: A Decade After Rwanda.” Council on Foreign Relations: A Resource for Nonpartisan Information and Analysis. 1 April 2004. Working Methods Reform. Center for UN Reform Education. Wilkinson, J., O’Sullivan, C. “The UN Security Council and Iraq: Why it succeeded in 1990, Why it Didn’t in 2003, and why the United States Should Redeem it.” University of North Carolina, Chapel Hill. Richard Falk. “Sovereignty and Human Rights: The Search for Reconciliation.” Global Policy Forum. May 2000. Slaughter, Anne-Marie. “Security, Solidarity, and Sovereignty: The Grand Themes of UN Reform” The American Journal of International, Vol. 99, No. 3. (July 2005): 619-631. Albright, Madeleine K. “United Nations.” Foreign Policy 138. (Sep. - Oct., 2003): 16-24.